The Peaty Paradox. That’s what they call it. The paradox is simply the strange mix of smoke and sweet mingled together in the glass as you smell and sip. The degree to which the producer is able to distill and develop the proper ratio of these contrary flavors determines the success of their peated malt. But sometimes we are just looking for something, anything underneath the smoke and we leave happy. When it comes to Ardbeg Distillery, take it from our humble yet accurate opinion, there is plenty underneath that 54ppm attack from Islay. When Glenmorangie Co. purchased Ardbeg Distillery in 1997, Dr. Bill Lumsden began work on what is now Ardbeg 10 Years Old, their flagship malt. Introduced in 2008, Ardbeg 10 enjoys an arguably iconic status among whisky enthusiasts for a host of reasons. These reasons include a bottling strength of 46% ABV (43% is average for mainstream bottlings), non chill-filtering for extra body, and an industry high peating level of 54ppm among readily available malts (post distillation level 24ppm). But most of all you have to appreciate a distillery making quality whisky after a period of inconsistent, near death production. Nose- Smoke with salty sea and iodine. Mossy, oil soaked. Smoked pepper seasoning. Underneath a nice mellon sweetness. Smoked meat. Taste- Seared steak. Salty with light vanilla sweetness. Creamy. Burnt marshmallow. Finish- Long and lingering. Wafts of smoke and char. Drying with warmth. Lemon peel and smoked meat. 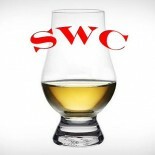 Comments – No complexity noted but a balanced and satisfying whisky. Solid flavors for a solid price point. A quality, go to pour. Recommended.